This ain’t delicate soup. Hearty rabbit meat, bacon and chunky cut veggies are the core of this simple, rustic wâpos mîcimâpoythat reminds Art of home. As if this gravy-like stew didn’t offer enough nourishment for an empty belly, a side of steamed root veggies gets some butter maple glaze and a topping of fresh berry shoots. There’s no mise-en-place in Art’s kitchen, but there is a damn good meal to be had. • Cut the rabbit into rustic pieces ie- whole legs etc, coat with flour and fry with oil in preheated skillet over medium high heat. Add a little more oil to make sure the flour doesn’t stick to your pan. • Cut bacon into bite sized chunks and add to skillet. Fry for approx 10 mins to brown evenly. When the rabbit chunks are browned on the bottom, flip them over. Make sure to add flour to the second side of the pieces of rabbit. Now is also a good time to add in the sliced onion. • Add beef stock and allow the stew to gently boil until the rabbit is half cooked. A rabbit thigh should be slightly pink in the centre. As well add in the crushed garlic. 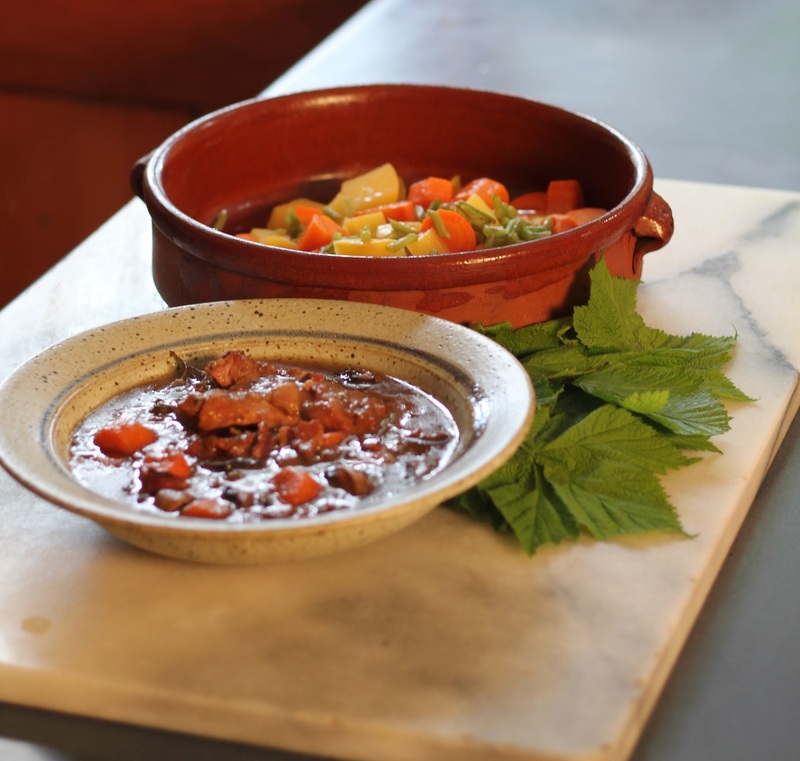 • Add cooking wine, bouillon, sliced mushrooms, sliced carrots, thyme and bay leaves then transfer the stew to a Dutch oven on the stove top at a medium-high heat or in to a roasting pan and place in a preheated 350 degree oven with a lid on. OPTION- If you have licorice fern root foraged from the wilds, this is also a good time to add a 2-3 inch piece for a slight fennel flavour to your stew. • If you want your stew gravy slightly thicker, add a flour paste and stir into mixture allowing it to blend in for 2 mins before serving the stew. • Steam rustic chunks of carrot and turnip in a steamer. • When the carrots and turnips are getting nice and tender warm a skillet and melt cold butter and immediately pour in maple syrup while stirring it into the bubbly melting butter. • Ladle some rabbit stew into a bowl. Drain the steamed root veggies, place on a dish then quickly pour the maple butter glaze over top and serve as a side dish to the rabbit stew. Top the glazed veggies with berry shoots sliced into quarter inch diagonal pieces for a nice tart crunchiness.